Sakura in the wind. 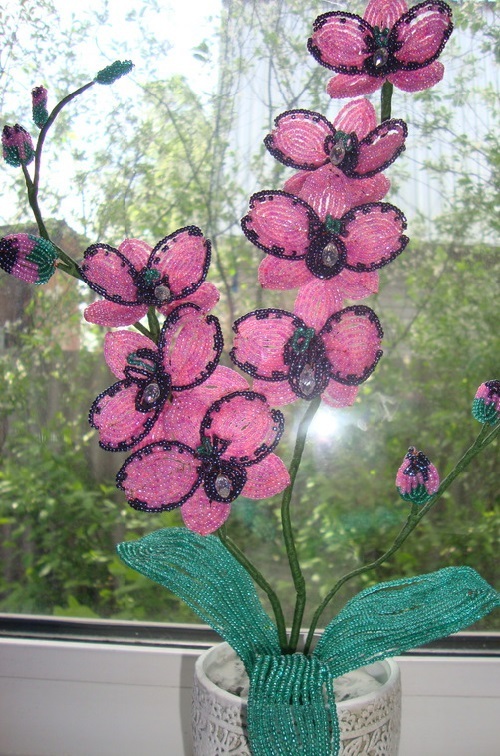 Made of beads, copper wire, plaster, acrylic paint and varnish. 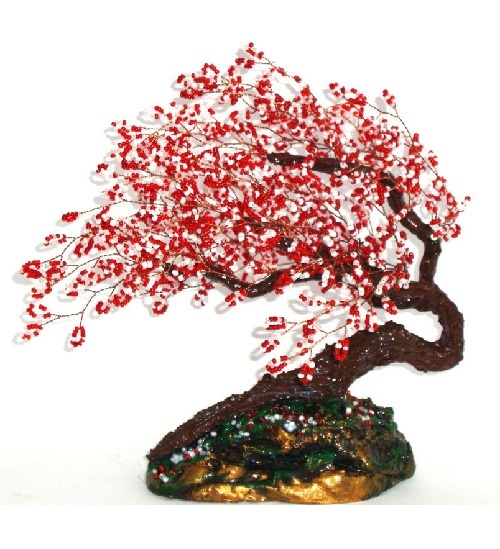 Sakura, or Japanese Cherry tree is a symbol of youth and beauty. 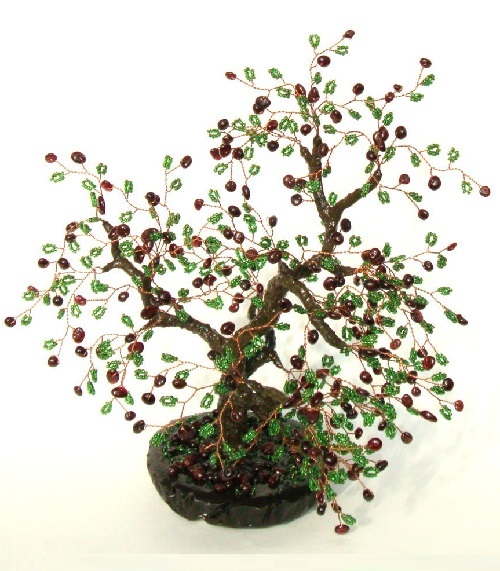 It symbolizes good luck and prosperity, longevity of joy and peace. 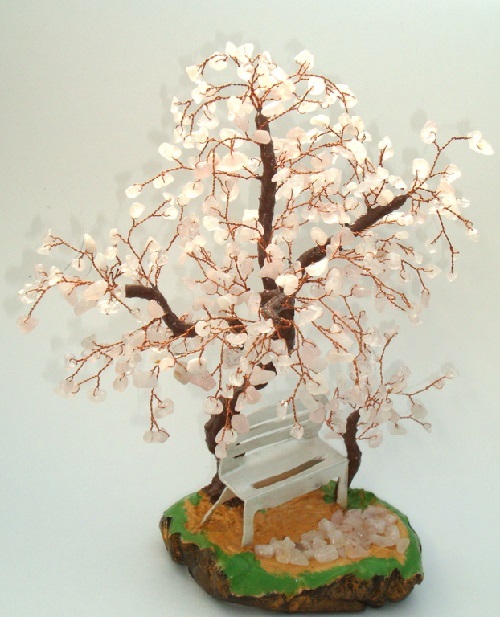 According to Feng Shui, sakura is translated as luck, love, beauty. 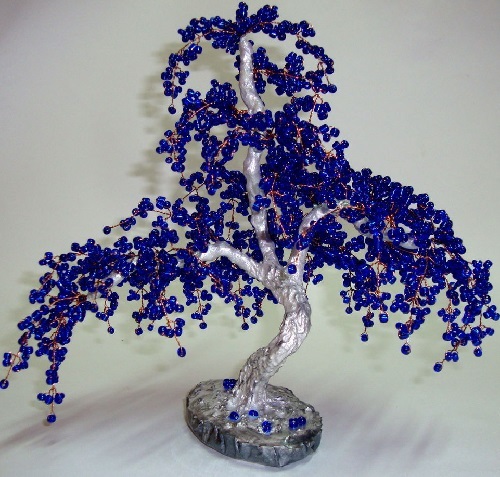 Siberian bead artist and craftswoman Oksana Solovieva creates Miniature trees of minerals and semi-precious stones for interior decoration and Feng Shui. 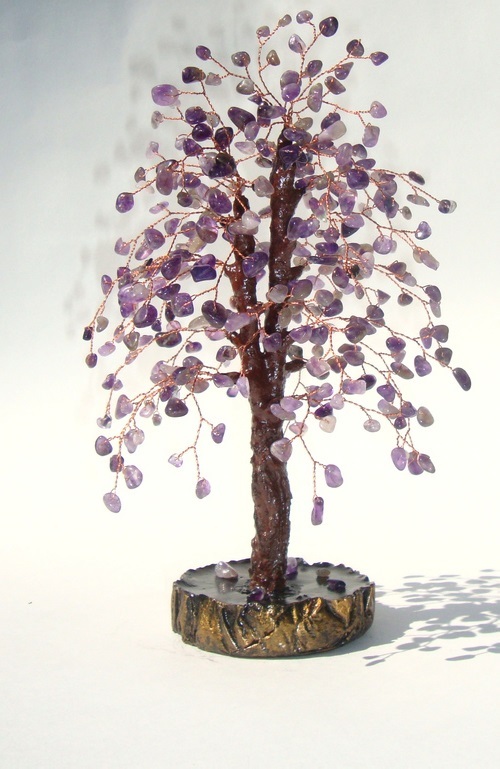 Creating her unique precious trees the master uses various minerals, including amethyst, quartz, garnet, glass beads, and also copper wire, plaster, acrylic paint and varnish. 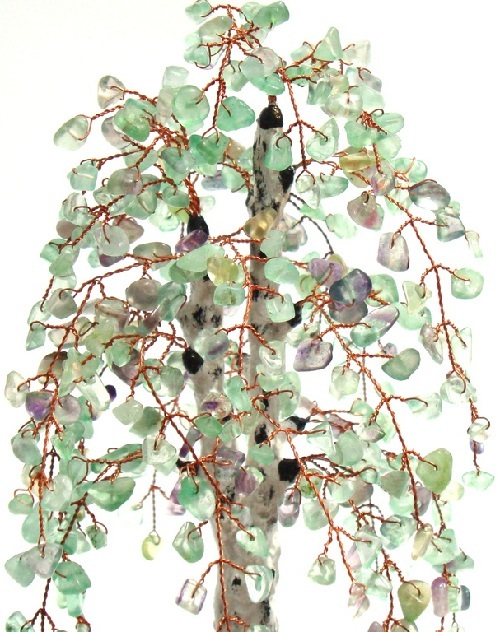 Magic properties of green onyx include support for private life. It is said that this stone protects against emotional dependency on others, and helps to see their true intentions. 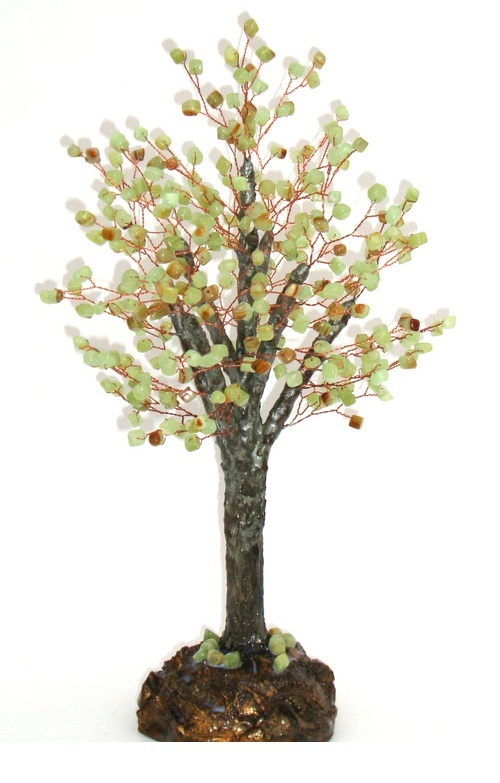 Energy of green onyx promotes the solution of complex problems. It lets you stay with sober mind in stressful situations and manifestations of heated emotions. Who in Europe and Siberia doesn’t know bird cherry tree (Padus racemosa). This remarkable tree (sometimes shrub) grows 2-10 meters tall on the northern boundary of the forest-tundra to the dry steppes. 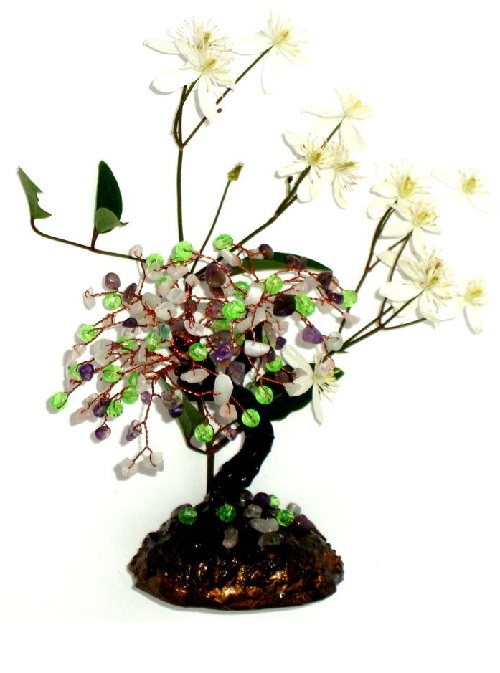 Lovely fragrance of flowers spreads it around a flowering tree, inadvertently causing deep breathe the spring air. 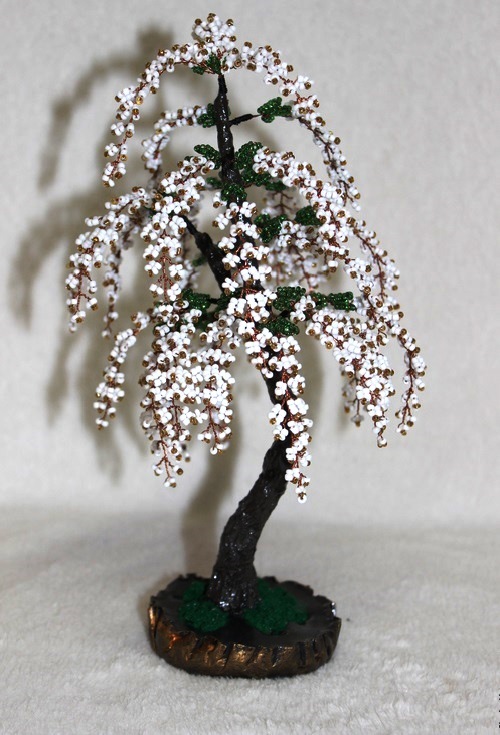 The tree is flowering in early spring: in the south – in April, in the north – in May, bringing joy to people and insects admiring clusters of white flowers, and later – bitter black berries eaten by birds, and even people. Cassia fistula (lat.) 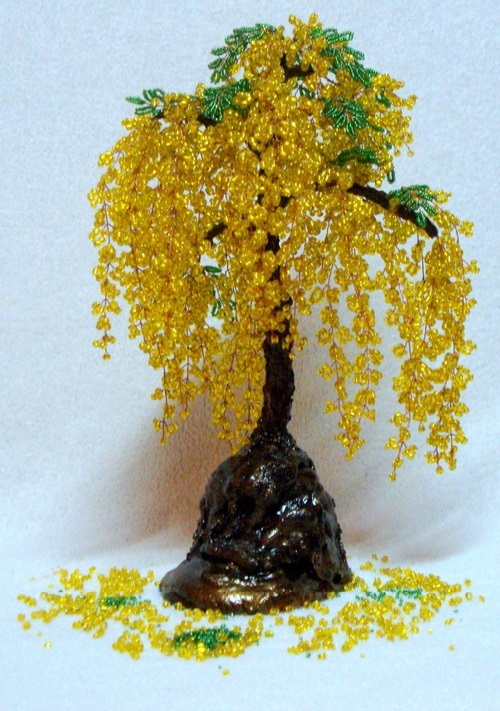 – golden rain tree – is deservedly considered one of the most beautiful cassias. 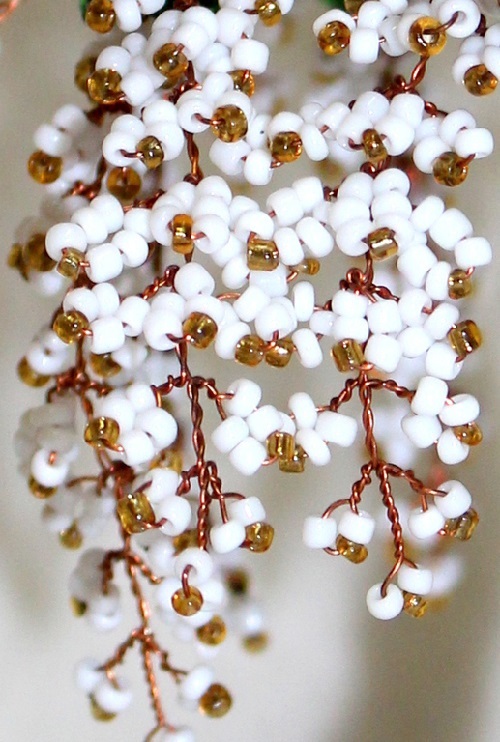 In late spring and early summer, the tree is covered with huge tassels of fragrant dazzling yellow flowers. Species of the genus Cassia, native to southern Pakistan, India, Myanmar, Sri Lanka and other countries in South and Southeast Asia. It is cultivated within the area, as well as in Africa, South America and the Antilles. 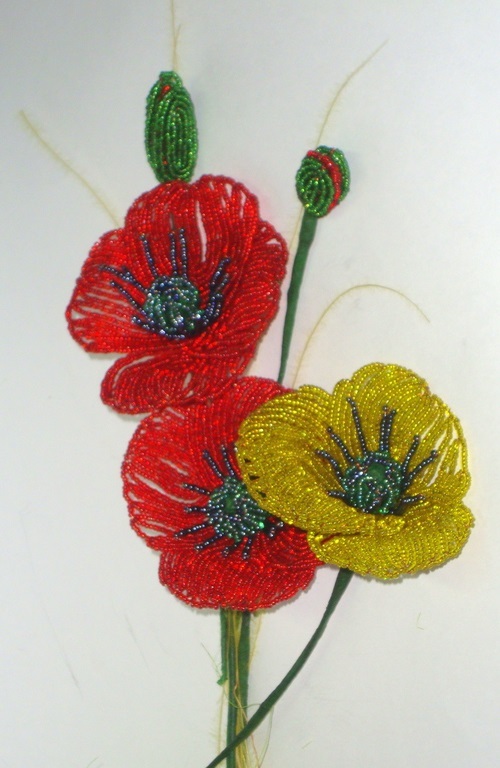 The flower of the tree is a national symbol of Thailand. 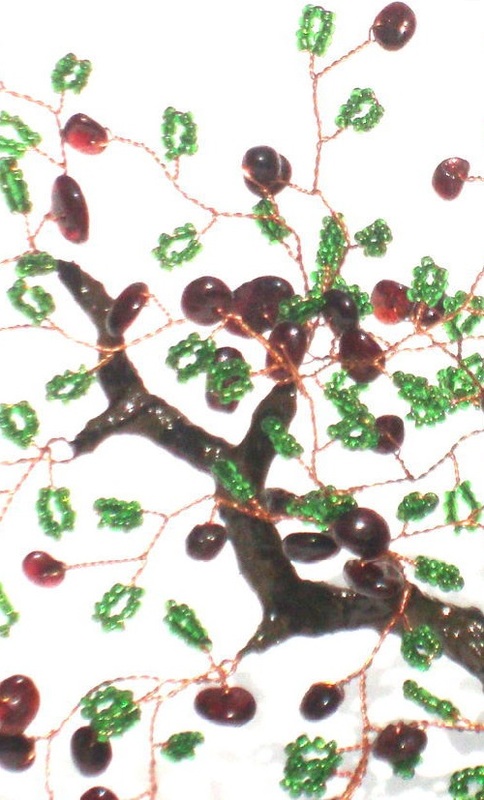 Tree of love and fidelity of natural garnet beads. The Stone Garnet – a stone that causes the self-confidence, gives you power over people, protects against the dangers of injuries and wounds, provides career growth, protects against adultery and brings happiness in love. Interior composition of natural rose quartz. Rose quartz stone, the magical properties of which are known for a long time, is able to bring love and harmony. It has a magical connection to the land, which is sensitive to any changes in her energy field, can predict the weather and natural disasters. The stone is considered a talisman, a strong love amulet. It helps to strengthen marriage. 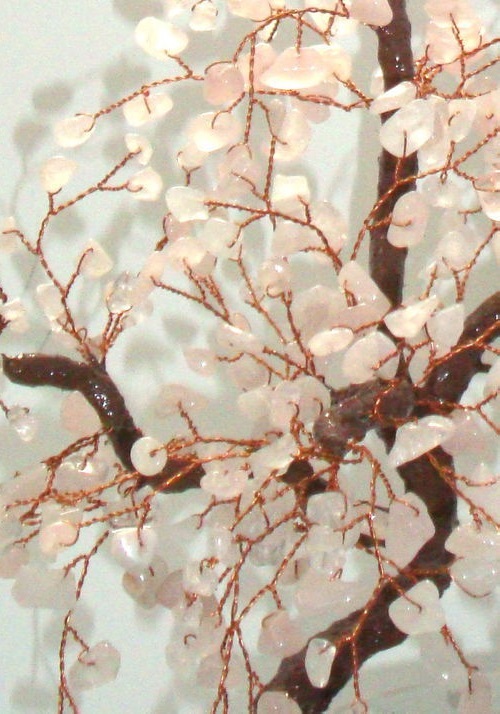 Rose quartz is the inspiration for artists. 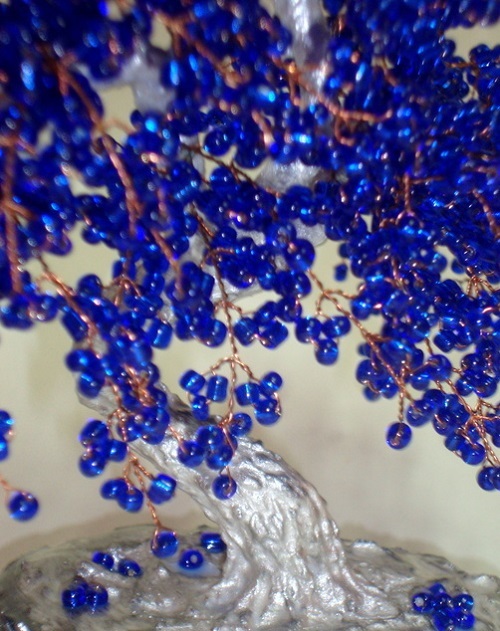 Blue Bead Tree (Jacaranda). 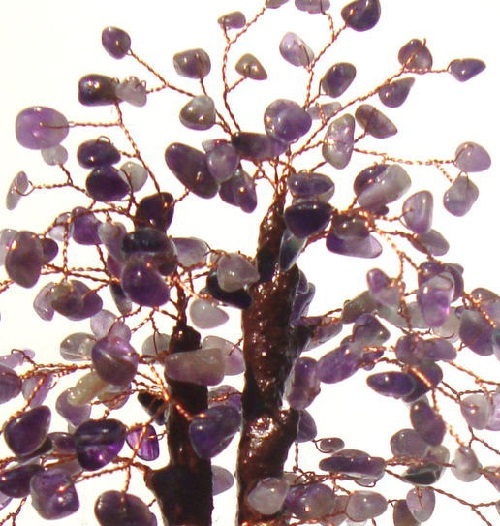 Jacaranda Tree gives beauty and brings good luck. 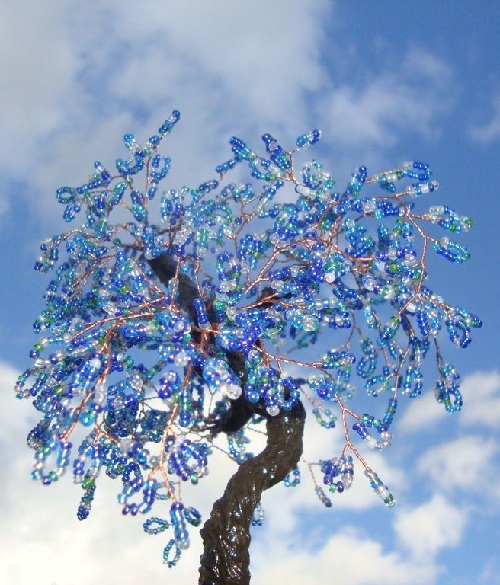 The second name – Tree of Knowledge. And even today it is planted near the universities as a symbol of enlightenment.